Out-of-Hours include weekdays 18:30 – 08:00, Bank Holidays and all weekends. 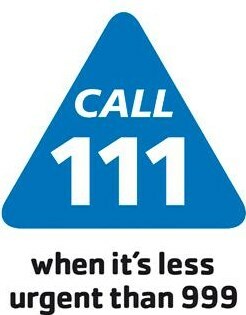 If you need medical help when the surgery is closed please call 111. NHS 111 is a telephone advice line and signposting service for patients with urgent health problems, but which do not need a call to 999. When you call 111, a health advisor will ask you a number of questions to assess which service will best meet your healthcare needs. If you need immediate medical care they can arrange for you to talk to a nurse or doctor, make an appointment for you to see a doctor or refer you to an appropriate healthcare service.